Would you try another book from Pimsleur and/or Pimsleur? If you’ve listened to books by Pimsleur before, how does this one compare? 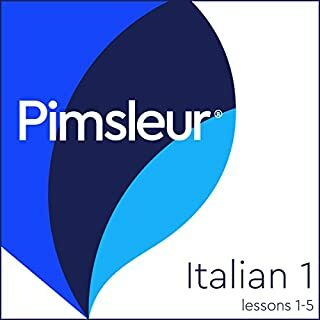 Could you see Pimsleur Italian Level 1 Lessons 1-5 being made into a movie or a TV series? Who should the stars be? Step 1. Start by watching the three videos called “Italian Pronunciation: Learn How to Pronounce Italian Vowels” on the YouTube channel ItalyMadeEasy. This gets you pronouncing the vowels correctly from the start, which is vital for speaking Italian in such a way that Italians can understand you. Neither the Paul Noble series nor the Pimsleur series addresses this vital need. In three months of learning Italian so far, nothing has helped me more than these three videos. Step 2. Then do all three parts of the Paul Noble Italian series, which will only cost you about $15 (pay for it rather than using credits, as each of the three units is only about $5). I love his language courses, and so does my wife. These three parts give you about 12 hours of instruction, and will on their own be enough to get you started in conversing in Italian. Step 3. Then, if you want to spend a fortune to learn even more and fill in some of the gaps in the Paul Noble course, get the Pimsleur courses. Step 4. In the meantime, all along the way, keep watching the ItalyMadeEasy videos on YouTube. These are excellent, taught by an extremely likeable Italian teacher called Manu. I especially recommend the video on vowels already mentioned, plus a video called “Learn Italian: Learn Basic Italian Greetings.” This is much better than any other video on this topic I have ever found, and is vital for learning how Italians actually use greetings in real life. For example, I was astonished to learn that foreigners in Italy should almost NEVER use the greeting “Ciao” (it’s only used for close friends and small children; using it with strangers or hotel clerks or waiters is impolite and disrespectful). Also, check out his Playlist called “Essential Italian Expressions” – small chunks of vital information about how Italian is really spoken. Apart from that, there are lots of other useful videos on this channel. These videos really fill in the gaps left by the more traditional language courses. Yes, if you want to learn French, start here! 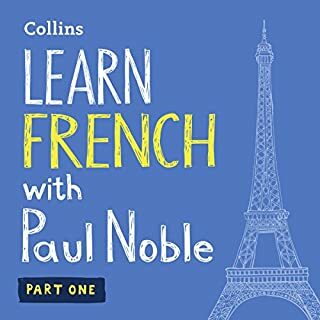 I learned more with these Paul Noble audible books in a month than I learned in a year of university French. I was worried about whether the courses would work for me, because I have always thought of myself as someone who learns visually. However, Noble is incredibly gifted, and his gentle but extremely intelligent approach just works. Also, I enjoyed the process. His insights into the language are quite fascinating, and because I was fascinated, I remembered. I did all three levels before going on a trip to Paris, and this enabled me to converse in an intelligent way when I got there. In fact, my pronunciation and grammar were so good that it got me into trouble a couple of times. I would ask a question so clearly that people thought I was fluent in French, and would start talking rapidly to me in French - at which point, I completely lost them! I still have a way to go, but I cannot think of a better foundation to build on than Noble's audio books. I have just bought all three Spanish books, as I am going to Mexico in 3 months time. THIS time, I am going to speak Spanish when I am there! I love his gentle, erudite, entertaining style. Everything. Sometimes he has a go at dry wit, and I liked that too! It taught me French! I have tried to learn many times before, and always failed. Noble's course was an intellectual breakthrough for me. Yes - if you want to learn French, buy these books! And then just listen to them every day for 30 minutes to an hour ... within a month, you will be stunned by how much French you know. Aberdeen is panicking. It's been 18 years since Grampian Police caught the Flesher - the notorious serial killer who butchered people all over the UK - and seven years since he was released from Peterhead prison, his conviction overturned on appeal. But when a container, full of joints of human meat turns up at Aberdeen Harbour it kicks off the largest man hunt in Aberdeen's history. Ken Wiseman is on the run and looking for revenge. 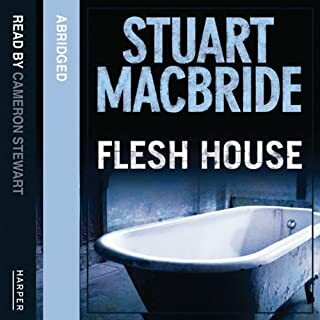 What disappointed you about Flesh House? I love this series up till now, but did not notice the "Abridged" on the description. I have spent days being confused, losing track of the story, and going back to see what I missed. Finally, I started reading a Kindle version, and realized that at least half the book has been savagely hacked out. (Ironic, given the subject matter.) I tried simultaneously reading and listening, and was appalled at all the great stuff that has been hacked out of EVERY page for the sake of what - brevity? At the expense of so many of this brilliant writer's words? I don't know why the author would have given permission for this travesty. Now I have given up the audio book completely and am reading it on Kindle instead. I will NEVER buy an abridged book again and will be asking for a refund on this one. Yes, but only because so many details were deleted that I didn't know what was going on half the time. The "abridgment" makes the already very convoluted plot so ridiculously fast-moving that I felt dizzy. What about Cameron Stewart’s performance did you like? Everything. Man's a genius, just like the author. Disappointment that half of it is missing. Please print the word "Abridged" in double sized, RED letters to warn potential buyers that they are only buying half the product. Lee Arnold and Mumtaz Hakim run a detective agency in London's East End. 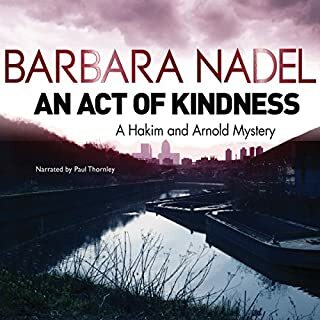 But their latest case could have devastating consequences.A new client, Nasreen, has sought Hakim's help. Recently moved to a new house, and with a baby on the way, this should be an exciting time- but Nasreen has made friends in the community that she cannot tell her husband, Abdullah, about. And when a murder takes place close to their home, Nasreen suspects that Abdullah also has something to hide. What did you love best about An Act of Kindness? The story, the characters, the kindness of many of the characters, the diversity of the characters. I loved the many accents of Paul Thornley, who did a great job with a challenging range. NO NO NO. In fact, here's where I nearly went crazy! I am still struggling through the book because I love the story, BUT - can we PLEASE have a second or two PAUSE between segments? This is an all-too-common problem in Audible productions, but it seems to be especially bad with this one. Audible production people, PLEASE - when people READ a book they get to see when there is a transition to a new section (different characters, different location). When we can only listen, we do not have that visual prompt to tell us that characters A and B have exited stage right, and characters C and D are now on stage. The number of times I have found myself thinking "WHAT? What just happened?" And then realizing that there has been a complete scene change. Honestly, there is NO PAUSE AT ALL between sections. If anything, the pauses between sections are shorter than between sentences (when at least the reader has to occasionally breathe). So then I am totally confused for a few seconds because the characters appear to be acting out of character - only to realize that they are DIFFERENT characters! Then I have to rewind and play it again to try and figure out where the change occurred. Sometimes I have to do it three or four times. So no, not an easy listen at all. Just a few seconds pause between sections would solve this problem. Is it a case of trying to keep the recording shorter? Or is it just appallingly bad production work, splicing together the sections slap bang next to each other, so that the poor listener is constantly confused? If that is the case, I appeal to the production editors to listen to a radio play sometime, and note how masterfully they ensure that it is crystal clear when scenes shift, and therefore don't confuse and torment their listeners. If it wasn't for this, I would rate this book a 5 star - but as it is, I think I need to ask for my money back on the grounds that what should be a relaxing experience is actually infuriating. Please train the production editors on how to do scene shifts. I pay a lot for my Audible books, and I expect a whole lot better than this. I expect to be entertained, not driven crazy.